The Largest Selection of Piano Reviews Online. 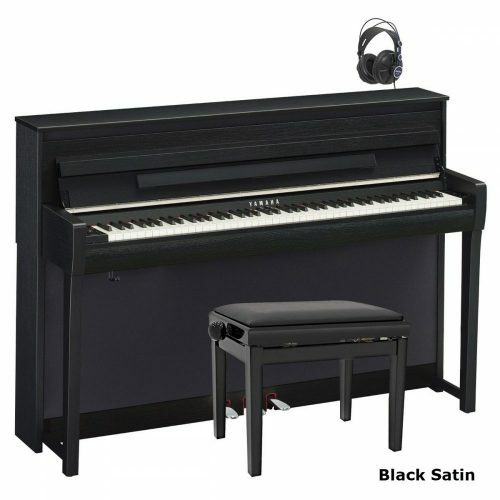 Read reviews and ratings of upright, grand and digital pianos. You can also write your own piano reviews and post them on this website. I ended up buying a Yamaha CP300 and set it up in a little alcove in my guest room. It has a great sound and seems to have a lot of versatility, is fully-weighted and has touch sensitivity. I think it’s going to make a great practice piano. I wanted something comparable to my grand (sound, touch, response) and so far it seems great.. I like the way it feels when I’m playing and there’s no noise (clicking) on the keyboard either like some I’ve tried out. However, it is heavy! It took my husband and son to get it upstairs to the guest room. How can they call that portable?? So far I’ve only played it a few times. I’m hoping to set up a practice schedule after the holidays of at least 1-2 hours a day. So far I am just learning all the things it can do and am extremely happy with it. It seems to have great versatility and I have already received many hours of enjoyment playing it. I am not a professional and just wanted a practice piano as my grand piano is near where my husband watches TV and that didn’t work. I haven’t had much chance to use it, but it seemed a good choice. Even with the volume knob on maximum, the last three or four notes at the high end do not have a strong sound at all, the last one being only a faint tinkle, and the notes do not sustain at all. The difference in volume and duration of the notes is very noticeable if you compare the higher end of the keyboard with the lower. Overall we are very pleased with the DGX630. 95% Of the time it is used in ‘piano mode’ to emulate a traditional piano, my mother is very pleased with the rich warm sound that you get from the DGX, also she finds the touch and key weight very similar to those of a traditional acoustic piano. She has said that using the other features of the keyboard can be very complicated, but she admitted she was just trying things without having read the manual and once she had gone through this she found them very easy to use, but still prefers to use it in ‘piano mode’ most of the time, as, after all, she did want a piano. The unit was delivered in two boxes, and the stand was very easy to assemble, mounting the main DGX unit on the stand is really a two man job, but I had the whole thing assembled (including the optional pedal set) within 30 minutes. I bought it from Dolphin Music in Liverpool and the service and delivery were top notch, as well as being significantly cheaper that other outlets, I would recommend them to anyone. Here is my review of the Yamaha DGX 650. I have had a Yamaha DGX 300 and a Yamaha PSR 8000 for a number of years. Now I wanted one instrument that could replace these. My choice was the Yamaha DGX 650. It has a piano sound and a key-touch that appears to me as good as the far more expensive digital pianos. It seems to be one of the most versatile digital instruments Yamaha has made. Besides being a very good piano, it can be used as an arranger keyboard with up to 5 tracks, as a keyboard with mange good voices and styles. It can record and play SMF and Audio files. It has various helps to people who starts playing from scratch. Even the bass sound is surprising despised the relatively small loudspeakers. I bought a Yamaha DGX 650 (which is most suitable for my purpose) from your shop on Saturday. a lady a piano. I told the girls to give my compliments to you. After a couple of hours on the internet, I discovered that there was a newer model of the 630, the Yamaha DGX – 640. It claimed to be the most realistic piano sound and touch every cloned on a digital piano. The feel was supposed to be better and the top keys were matte. There were more sounds, styles and voices (535 I believe) and the walnut finish made it look stunning. I knew this was going to be the focal-point of my Living Room! So I went down to my local music centre and took a look at this machine, boy was I impressed. I tested it for response levels, sensitivity, sound quality etc, just like on the site. I also discovered that there was an optional pedal board for it, LP-7 containing all three pedals which was even better. There was crystal clear display, same with the speaker quality. This well and truly had everything I needed AND MORE for a nice £612. The same piano was in the music store for a whopping £729! Complete rip off!! Then again, same with most music stores. I took it out of the main box and placed sliced the seal, slid it out and gazed! It was bigger and better than I thought, it felt sturdy and when shaken, nothing rattled. Setting that aside on the sofa I arrived at the good stuff! I annihilated the delivery box and literally threw it out of my site. It may have hit the TV a bit but I wasn’t going to let that spoil the moment! Then carefully and delicately I sliced the sealing tape, removed the styrofoam and there was the beauty… Wrapped in plastic covering. Sliding it out showing the pitch-bend wheel and the left speaker already made me a bit too excited so I just thought “screw it” and dragged it out , pierced the wrapping and ripped it off. There it was! I digged in to find the instruction manual and the power supply. Fortunately there was a socket close to me so I powered it on and pressed a note. The sound was wonderful. Strong and vibrant. After playing around with it for a couple of days, I am very happy with the result of my investment. I upgraded from a little Yamaha YPT-210 61-key 32 note polyphonic no touch response keyboard to this 88-key 64 note polyphonic touch responsive graded hammer action digital piano. 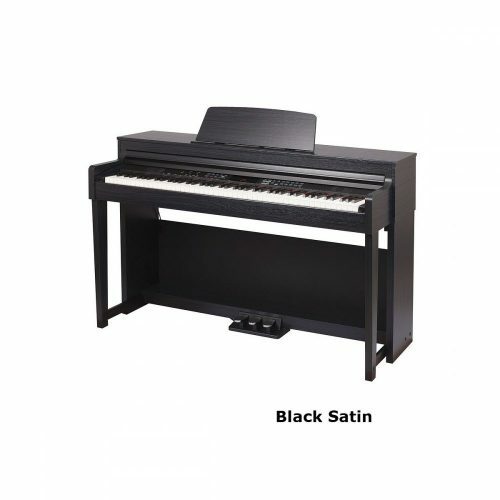 I tried out some of the Clavinova series pianos that they had in the £800-Â£1000 range and trust me, they are not worth the money, you literally pay more for less. although still learning the full capability of the piano itself let alone playing it. As an I.T. person and not a keyboard player myself I am mightily impressed. a “real” one is a no-brainer. speakers there is not much to not work. Many thanks for your digital piano buyer e-book and free piano lessons which I am currently devouring. My wife, Barbara, is the principal pianist and I really downloaded these items for her so she may be in touch directly in due course if that is OK.
She’s been learning on a DGX230 for 18 months and feels it’s time to move on (although this keyboard is pretty remarkable value for money). In fact we decided to purchase the DGX 640 only to find the middle octaves far too shrill or almost ‘harpsichordal’ for our liking. The bass and treble octaves are far more convincing than on the 230, however, and the feel of the keyboard far superior. Suffice to say the DGX640 has been returned and we decided to audition locally. We found a second DGX 640 to sound similar to the one we returned so I don’t think it was a faulty item. We’ve also ordered the Rocket Piano course – it sounds really good and the reviews are unanimously favourable. Learning to play is far more complex and difficult than I imagined (especially for a 65 year old brain!) but these courses may well encourage me to persevere. I read the reviews on your site Graham, Thankyou for your input.I have since bought the Yamaha DGX 640. I am extremely pleased with my digital keyboard.It does exactly what it says on the box. The Yamaha DGX-640 features the Live!, Sweet! and Cool! voices which I must say are truly impressive. 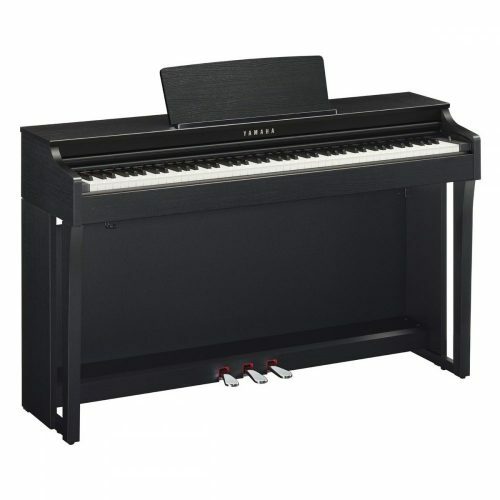 The default piano has an amazing sound for such a low price Digital and you will be astounded. Some have critisised this model for the lack of speaker power, although I must disagree. I am lucky as we have this piano at the school im at and I have performed on it in a large hall without any external amplification and it held up well. The piano has great bass in the lower notes, which you expect on a Grand Piano. The keyboard feels great considering it’s Yamaha’s lower range ‘GHS’ (Graded Hammer Standard). I have played on many different high end ‘Clavinovas’ and the keyboard on the DGX really does replicate an acoustic piano. It features matt keys unlike the cheap keyboards you find at Argos for eighty pounds! The Yamaha DGX-640 (in cherry and walnut) is a great Digital Piano and I would reccomend to anyone looking for a well priced, acoustic replacement. I am not a professional pianist but I know a great piano when I play one and this machine is what its says on the tin; a Portable Grand. The differences between this and the Clavinovas is that the Clavs have slightly better touch and piano tone (as they are sampled from Yamaha CFIIIs – Concert Grand), but I really do not see the point in paying more for less. I am in love with the DGX-640 and i’m sure you will be too. These instruments are currently going at great prices so I truly reccomend catching one while you can! THE YAMAHA DGX-640 IS A TRULY OUTSTANDING PIANO!!! inclusion of the 401R in your “fully weighted” preferred list. The enhanced input features also look to be assets which will make the rp401 suitable for a longer time. I wish I was in a position to reward you for the great info you provide, but alas I’m in Vietnam. Thanks though for putting such useful information in the public domain. I had NO idea that a digital piano could bring me such joy. If it was not for your website, all the information that you supply – I would still be without a piano. I am super happy with my piano. My 18 month old loves the sound of the church organ and the choir, making me want to buy a piano and get her prepared in the long term – I could dream seeing her playing the organ in a cathedral – no pressure. I wasn’t looking for something high-end in the digital market, as I never played the instrument that well myself (I barely passed Grade 8) and I am just not sure how interested the little one will be in a few years’ time. However, growing up playing a Steinberg made me a bit fussy, and I want my digital piano to sound and feel like a real (‘acoustic’) one. My natural choice is a Roland (sorry, never a Yamaha fan for some reason!). I thought I would get a F-120, as it is slim, seems good for the purposes I need, was within my budget of less than £1,000, and sounds quite good on YouTube videos. Went into the UK Piano Store in Enfield, got my hands on the F-120, it really sounded great….. until I touched the HP504 that is. The sound and the touch was just SO MUCH better on the HP504 and it felt so much more natural that I couldn’t help but bought it. It is another £470, almost 50% extra to the F-120, but for me it is totally worth it. Not only it sounds and feels a lot better, but also the technology swayed me. I always believe if you are to get something electronic you are meant to buy the latest model/technology, otherwise it will be out-dated in two months’ time. The HP504 has it all; it was just out this year, whereas the F-120 has been around for a couple. I have had the HP504 for two weeks now and I cannot tell you how much I am enjoying it. The grand piano mode (Concert 1) sounds good for ‘performance’ pieces, and the Upright piano mode (Upright 1) sounds just like my good old Steinberg. I even start to add on other voices when I play the theme tune of Laputa, which is great fun. I tend to put the key touch to its heaviest (H2), probably spoiled by the Steinberg that I am so used to; and I like putting the brilliance on high (7), even when playing softer music. My preference in ambiance differs: if in grand piano mode I prefer it higher (7-8), if in upright mode mid-level is good enough for me (5-6). All in all, I cannot fault the instrument. It is a pleasure to have, it looks wonderful, and it sounds and feels enough like a real piano. I would also like to thank the sales team at UK Pianos. They are so busy, but they are so knowledgeable. I thoroughly enjoyed the discussions with the ladies during both of my visits; of course Graham’s help on the scores, prices etc contributed to it tremendously as well. A couple of suggestions to make it even better would be to include discontinued models on the Howard Score chart – at times I wondered how the HP504 fairs with its predecessor – the HP503. Also, as the world has gone crazy on YouTube, why don’t you share your own demo videos on YouTube, Graham? Many thanks for your help and discussions, Graham! Thankyou again for your most thorough and extremely helpful information in the digital piano bible. You empowered me to make an informed choice and steer away form the pseudo-knowledgeable salespeople. I made a purchase last weekend. I had the intention of the purchasing the Yamaha CLP 575. I changed my purchase decision to the Roland HP506. The salesman recommended both but told me he preferred the Roland sound and feel over the Yamaha, which I guess is a personal choice. I am a novice and found both models to be quite similar in feel. Sound quality and performance is something I cannot yet accurately gauge but I am confident both will perform well. The Roland was around $500 cheaper and in line with the CLP545 pricing. I think its specs lie somewhere between the 2 Yamaha models. The Yamaha warranty was 3 years and I was told only one person covered Western Australia, South Australia and NT. He tried to up sell me to the HP508 which was a wonderful piano, but I simply couldn’t afford the extra $1500. The piano arrives tomorrow. My daughter and I are looking forward to our ongoing piano journey. I have been playing a Yamaha Electone organ for many years but recently realized that every time I sat down to play I had the organ set for ‘Piano’, so it seemed right to think of getting a piano instead. But where to start looking! I searched many websites and found Graham Howard’s free Digital Piano Bible. I cannot stress how helpful this was. I printed the pages I wanted to keep and eventually was drawn to the Roland HP 506. I asked for Graham’s advice, having told him of my musical background, and he agreed that this would be a good piano for me. I have had it now for a week. This is a wonderful piano plus… Firstly, such a lovely sound and with so many features that will keep me on a learning curve for a long time. I particularly like that I can select and listen to a piece of music on the piano, then try to emulate it, or even play along with it! The accompanying book of 60 Classical Masterpieces is excellent. I can also record and listen to what I have played – a very useful feature. The headphones are a must when it comes to that! There are so many features to this piano. I particularly like the built-in metronome, the fact that the pitch can be transposed, and that the piano can become two halves allowing for two players. Thank you, Graham, for pointing me in the right direction. I am delighted with my purchase. I decided on a Roland HP508 and am thrilled with it. I am 70 years old and played piano when I was about 8 then gave it up at age 16.
on my own now I have no distractions. Also my friend and next door neighbour is a pianist and former teacher. I am already mastering Scott Joplin’s The Entertainer! footprint and sleek simple look is exactly what I was hoping for. tell the difference? Probably not. as good as I’d hoped. the Roland (including one on this site) mentioned that it is a bit bright in the higher registers. I can’t hear it. there and I imagine they’re competently engineered. Bottom line, I’m delighted. The DP-990RF not only looks great but sounds fantastic. instrument for years, I considered the extra investment to be minimal. responsive velocity sensitivity. All in all, I’m very satisfied. But . . . I do have some complaints. would dictate the same for the piano. this most irritating situation at least once. should be in better tune. acoustic piano. The speakers let it down but through some headphones, the Roland is hard to beat. an inexpensive non-examination standard Yamaha and acquired a Schimmel baby grand later. low end and a muffled high end. and this made it my top choice thereafter. given the age of the display model and the volume of human traffic through the shop. slipping on the keys on this either. felt the need to use the other voices or features. pointing me in the right direction. Pianos’ expert guidance is much appreciated. I purchased a Roland DP990RFPE on Thursday, from a local music instrument outlet. keyboards, set out in various areas of the building. play some classical pieces that include the top “C”, and my accoustic piano’s keyboard ends on the “A”. earlier trials of the CLP 370 last year. indescernable in the room below.This was without any other sound being in the lounge. One thing not mentioned so far is the size of the keyboard “Box”. Sorry for calling it that but that is what it is. school, over fifty years ago. I bought a DP 990RF around 16 months ago, when I gave you a brief review. and normal physical interface of the piano, well worth the price. But I wouldn’t buy it again. have bought it despite the additional expense. Anyway, thanks for the great information you make available! I purchased a Roland DP990RFPE on Thursday, from a local music instrument outlet in Salford. It was not a shop, more like a warehouse with all the instuments, – drums, guitars, brass instruments, other keyboards, set out in various areas of the building. This piano is magnificent, having tried the Yamaha Clavinovas CLP 470 and 480 earlier in the week, at a main piano store in Bolton. Both the Yamahas had no “note tone” in the last 4 or 5 top notes, both in normal use and with headphones. This was the very first thing I tried on the Roland, even before sitting down on the stool. The top “C” rang out clearly as a musical note, not like the sound you get when you “clap” two pieces of wood together. It was because of this lack of tonal sound on the top notes that a decided to look eleswhere from the Clavinovas. I do play some classical pieces that include the top “C”, and my accoustic piano’s keyboard ends on the “A”. The Roland is everything you could wish to have in a piano. My accoustic piano is an Eavestaff “Mini-Grand”, just over 40 years old but an ideal small piano for domestic use. The Roland is tonally better, with very rich base and lower middle notes and equal to slightly better in the upper register. The keys settings have a choice of five settings from two heavy through normal to two light settings. the nornal is just like a new accoustic piano. The rapid repeat of notes ia also no problem, being able to play trills without any hesitation. I bought the piano so that I could practice in silence – Chopin Studies, a wide range of Rackmaninov, Debussy, Beethoven, Schumann, Listz. With headphones, none of the sound lustre is lost, one thing I noticed in earlier trials of the CLP 370 last year. Key clatter is indescernable to people in the same room, however my wife could hear this in the lounge below my old office ( the small bedroom), I am converting into a “boy’s room”/spare bedroom. I have read about this on a website and have inserted rolled rubber car mats beneath the feet of the unit. This has considerably reduced the mechanical noise transmitted from the keyboard, down through the frame, the carpet, and floorboards, to it being almost indescernable in the room below.This was without any other sound being in the lounge. One thing not mentioned so far is the size of the keyboard “Box”. Sorry for calling it that but that is what it is. A nicely damped lid that opens up to reveal the keyboard and control panel. On looking through the comprehensive users manual, I found you can lock the electronic settings you have set. Before being aware of the lock facility, in my playing my finger tips caught one of the electronic buttons and set off an auto playing of one of Chopin’s famous Polonaises. The whole unit is in polished black ebony, reminding me of the Bechstein Grand piano I used to play at my old school, over fifty years ago. After my first visit to the warehouse, I received an e-mail from the piano department manager informing that the model I had tried had just been replaced by a new model having a few new inovations, which were of no use to my requirements. As mentioned before, a wonderful instrument for it’s sound, touch and response, just like the best accoustic piano’s with the added benefit of being able to play in silence, and not being an annoyance to members of the household and neighbours. Thank you for your guide. It certainly highlights the various points you need to bne aware of and consider before buying a digital piano. After trying RG-3 I decided that the Roland is not realistic in its sound. It has a very dull amd booming bass and the tones sound artificial. Even though it has the new “supernatural” sound. The RG-3 was a special offer from the store (5900 Euro): they had to get rid of it since its successor RG-3F was coming. using many loud chords and the pedal you might get the “woow” feeling. But playing a chromatic scale across the keyboard revealed many deficiencies. Notes that were too loud, too sharp or just plain ugly.